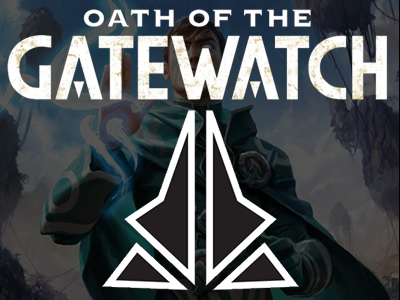 For both ca­su­al and hard­core play­ers of the com­pet­i­tive trad­ing card game Magic: The Gathering, any hopes of re­main­ing spoiler‐free for the up­com­ing Oath of the Gatewatch were quick­ly dashed on see­ing the top thread of the day in the game’s ded­i­cat­ed red­dit sub‐forum. The thread, sim­ple ti­tled “Mythic and Full Expedition Spoilers”, was not just a spoil­er of cer­tain cards to build hype, but rather a mas­sive leak of cards, most of which were weeks away from see­ing the light of day. The cards in ques­tion in­clud­ed this set’s Zendikar Expeditions, spe­cial reprints of highly‐played lands from non‐rotating for­mats such as Modern and Vintage. Further in­for­ma­tion on the Zendikar Expeditions can be found in these ar­ti­cles from our site. Other cards to be leaked in­clud­ed some of this set’s Planeswalker cards, which rep­re­sent ma­jor character’s from Magic‘s lore. Given the mag­ni­tude of the leaks, many play­ers were left won­der­ing who had been be­hind the leaks, or if there would be any reper­cus­sions for leak­ing this in­for­ma­tion. 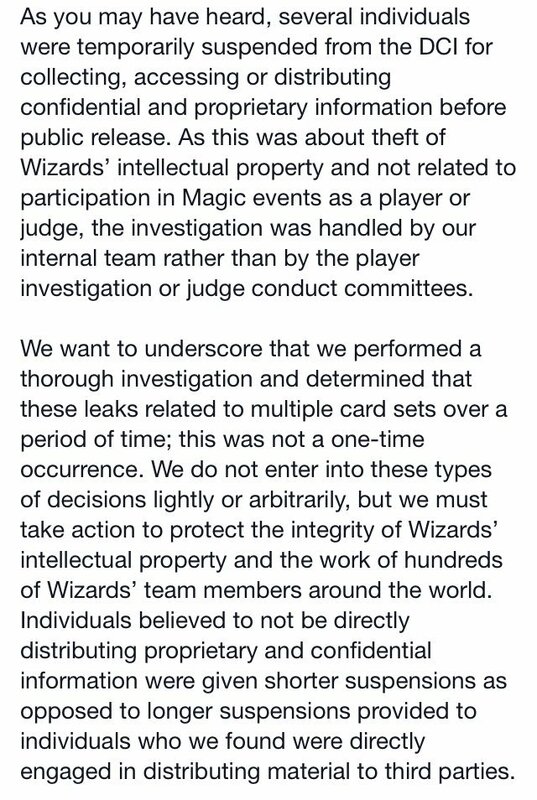 On December 21st, Wizards of the Coast (WotC) re­leased an an­nounce­ment con­cern­ing sus­pen­sions for eleven of their judges, rang­ing from lo­cal to area to re­gion­al lev­el. All judges re­ceived 3 month sus­pen­sions for “[in­volve­ment in] col­lect­ing, ac­cess­ing and dis­sem­i­nat­ing Wizards’ con­fi­den­tial and pro­pri­etary in­for­ma­tion be­fore it was of­fi­cial­ly made pub­lic”. 2 year and 3 year sus­pen­sions were also hand­ed out to three ad­di­tion­al judges on December 18th; it’s cur­rent­ly un­known if their sus­pen­sions were re­lat­ed to the December 21st sus­pen­sions. Notably among the judges sus­pend­ed is Justin Turner, the USA‐Southeast Regional Coordinator. On December 22nd, the Judge Manager re­leased a state­ment con­firm­ing the rea­sons be­hind the judge’s sus­pen­sions. Reactions to the sus­pen­sions have been mixed to neg­a­tive on Magic: The Gathering‘s red­dit sub‐forum. Other re­gion­al judges were quick to give their sides of the sto­ry; name­ly, that of the sus­pend­ed judges, only two were ac­tu­al­ly in­volved in the leaks and the rest were “dis­pro­por­tion­ate re­sponse.” This in­cludes the per­son who brought the leak to WotC’s at­ten­tion and was help­ing them with their in­ves­ti­ga­tion. Turner also weighs in on the sus­pen­sions, say­ing that he was only giv­en two hours no­tice be­fore the in­for­ma­tion re­gard­ing the sus­pen­sions was made pub­lic. He also al­leges that the judges who were sus­pend­ed were not in­volved in the in­for­ma­tion leak and that WotC did not dif­fer­en­ti­ate be­tween who was and wasn’t in­volved in the leak. CJ Shrader, one of the 3 month sus­pend­ed area judges, con­firmed that he and oth­er sus­pend­ed judges were in an ap­peal process with WotC. It’s un­known how long the ap­peal process will take, if the sus­pen­sions will be over­turned, or if Turner will re­turn to his po­si­tion as Regional Coordinator (now cur­rent­ly oc­cu­pied by Scott Marshall). Of big­ger con­cern for Southeast play­ers is the sheer num­ber of re­gion­al and area judges that re­ceived sus­pen­sions, leav­ing many con­cerned that there sim­ply won’t be enough ac­tive judges to cov­er reg­u­lar events and up­com­ing tour­na­ments, specif­i­cal­ly the Atlanta Star City Open in January. As judge rul­ings on card in­ter­ac­tions and play­er be­hav­ior is an in­te­gral part of Magic games, hav­ing a large event un­der­staffed can have tremen­dous im­pacts on tour­na­ment play. It’s un­known whether the re­main­ing Southeast judges will walk over their fel­low judge’s sus­pen­sions. Protests by oth­er judges are un­der­way cur­rent­ly. James Bennett (also known as “uber­nos­trum” on red­dit and Twitter), a re­gion­al judge, has dis­con­tin­ued ser­vice for pop­u­lar judge ser­vices in protest of the treat­ment and public‐facing state­ments giv­en by WotC. While leaks like this are few and far be­tween, there has been sim­i­lar pun­ish­ments hand­ed out to pre­vi­ous leaks — specif­i­cal­ly the leak of the en­tire New Phyrexia set, which earned the leak­er of the “Godbook” a three year sus­pen­sion. For many play­ers in the red­dit Magic sub‐forum, the ap­proach tak­en by WotC is dis­sat­is­fac­to­ry. As WotC rarely, if ever, gives the ra­tio­nale be­hind it’s sus­pen­sions, play­ers are left won­der­ing if sim­i­lar “scorched earth” poli­cies will be im­ple­ment­ed in fu­ture sce­nar­ios. A per­son, not a la­bel.